As a kid, Roshni Mukherjee would often dream of becoming a teacher. Her dream to teach made Roshni quit her job and start a virtual school where she teaches science and maths to school children for free. Her YouTube channel has over 70,000 subscribers and she has uploaded over 3,900 videos so far. In the future, Roshni wants to expand her work. She is planning to make videos for students of classes 6-8 too. One would hardly read such stories reported by the traditional media, but this was covered by TheBetterIndia, a Bangalore based online publication startup that holds a claim to reporting positive stories, happy stories and stories of unsung heroes. 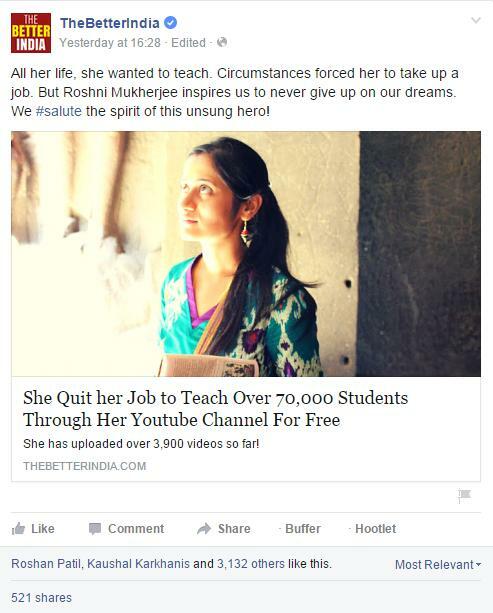 Roshni is one such hero and her post was shared more than 3K times and liked by another 6.9K users on Facebook. “We wanted to talk about ideas that have influenced communities, we wanted to showcase people who have brought about a change in their areas, we wanted to talk about the forgotten art forms of India, celebrate the successes of organizations that have improved the lives of many children— the list continues to grow with every passing day,” said Dhimant Parekh while interacting with LiveMint in Nov, 2013. 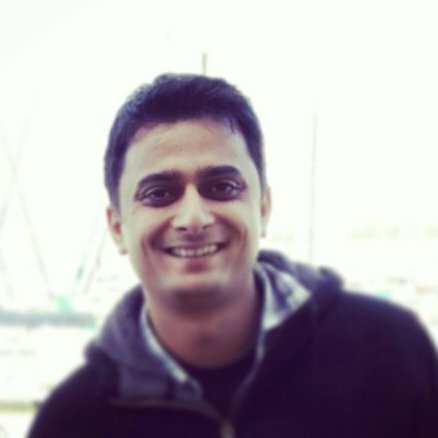 Over the last few years, things have changed a lot for TheBetterIndia (TBI) – while the startup has become a strong name in reporting positive and happy stories, the reader base now stands at more than 1.5M monthly readers with more than 318K fans on Facebook which help these stories gain massive eyeballs. The startup even raised an undisclosed amount of funding in the month of May from Infosys’ former member of the board of directors Mohandas Pai. This happens to be the second round of funding for the publication this year as during March the company had raised $160,000 funding from members of angel network Intellecap Impact Investment Network including Raveen Sastry, co-founder of Myntra, and Sohil Shah. Looking at the Alexa data for the site it is quite evident that Facebook has been the biggest driver of traffic for the site but apart from the social media traffic TBI has seen a good conversion with email marketing. “Email has worked really well for us, especially because this is one channel where a user explicitly opts to get your content. This means that the user is already very inclined and interested in your business. Hence it is imperative that you do a great job with email – it’s the only captive audience held exclusively by you,” informed Dhimant who believed in email marketing since the early days. Talking about his early experience Dhimant shared that the idea to go with Mailchimp was because it gave free access for upto 2,500 members. Mailchimp also integrates well with WordPress and most importantly it had the RSS to email feature which was an easy job to setup regular newsletters. Post that one of the things the team at TBI realized that any reader who subscribed to their list today would have most likely missed the best content of the previous months or years. So TBI decided to use Mailchimp’s Automated campaigns feature to send out some of the best past stories on different days after a user subscribed. This way it ensured that all new subscribers got to read its most viral articles too. Additionally, once the user had received a few number of emails, TBI would send a personalized email to their subscriber, asking feedback on the newsletters so far. “This feedback helped us a lot in fixing issues and ensuring that our mails were fine-tuned as per our readers’ likings,” added Dhimant. These TBI Corporate Newsletters are customized for brands with a mobile design in mind and work mostly on all email clients. While this keeps employees motivated, informed and positive, this also has brought a new source of revenue for TBI. Globally, publishers are rethinking email marketing as their own social network, at a time when popular social networks such as Facebook are killing reach and leaving with no choice other than joining hands with the network. Email marketing is all about experimenting; Dhimant and his team are busy in that. Right now the team is testing subject lines to delivery times and content formats. For instance, TBI learnt that the best time that works for a majority of its readers is between 1 to 4, so now emailers go out during the new time. Additionally, TBI is also experimenting with technology that ensures that an email goes out to a person based on which time-zone she is in and when she is active on email. TBI’s email marketing strategies are itself a positive story for all those online publishers who don’t value the importance of email marketing.